I'm a day late to the party. 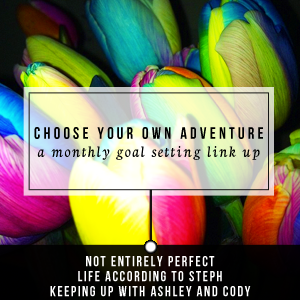 The Chose Your Own Adventure link up party that is. I love setting goals I even sometimes accomplish the goals I set for myself. December's adventure was simplify. I took this pretty literal. Back in October I asked my girls what they saw the holidays looking like. What they wanted to do, what they wanted to stop doing. When December and the crazy holiday schedule game around, we followed through with what we wanted to do. It was selfish but it was stress free and fun which is exactly what we were going for. This meant the Christmas tree came down on Christmas Eve. We had opened our presents and the girls were on their way to their dads house so there was really no need to keep it up. There was really no point other than as yet another play structure for the cats. January's goal is complete. I'm getting my list short so I actually have a chance of accomplishing them. Finally drop the Goodwill donation box off. Its only been sitting in my hallway for 2 months. lol yeah the cats and the christmas tree! i don't think i'll put mine up next year, too annoying. i leave goodwill stuff in my spare room for months and months before i finally drop it off. hahahahaaha I have a bunch of donations I need to get out of my house too. This is the month. Hell, maybe this weekend! my car looks like a homeless person or hoarder lives in it. I'm thinking about just putting up small ones that I can put up out of their reach. I don't look in it for fear I'll decide I want to keep something. I actually added some stuff to it this weekend. But it really does need to go. I think I will drop it off when i drop the recycling off.